First Lady Crissy Haslam addresses the crowd. 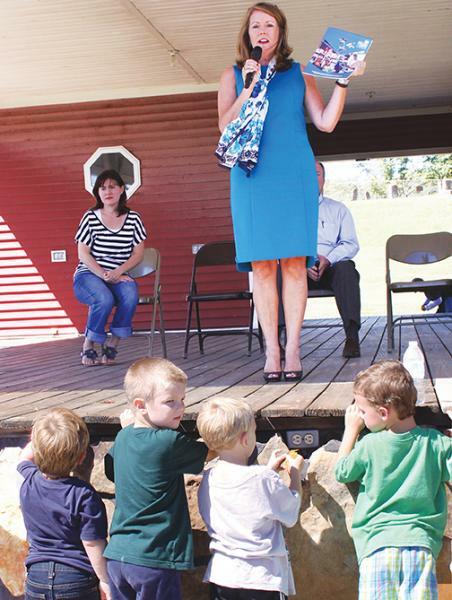 First Lady Crissy Haslam headlined the Books from Birth 10th anniversary bus stop Tuesday (Sept. 23) at Woodbury's Dillon Park. Governor's Books from Birth Foundation (GBBF), in partnership with Dolly Parton's Imagination Library and statewide county affiliate programs, builds a foundation for reading and learning through books for Tennessee's children. All children from birth to age 5 are eligible to receive books at no cost to families. Providing books in the home is a unique opportunity for family engagement, vocabulary and reading skills development. "It's a program that Tennessee can be so proud of because we have the Imagination Library in every county in Tennessee. Other states would like to do that, but Tennessee is the only one that has been able to do it. Other first ladies and first gentlemen from other states call us and ask how did you manage to do that," Haslam told the crowd of youngsters and parents gathered at the park's pavilion. Theresa Carl, president of the Governor's Books from Birth Foundation, was also there and gave special thanks to Melissa Teply, chairman of Cannon County's Imagination Library program, and everyone involved in the local program including Lisa Black, Damian Graham, Regina Merriman and Lou Nave. "This is something that doesn't only happen in Nashville. It happens in every county in Tennessee," Carl said. "I'm here to announce that we are 10 years old and have given away 21 million books. Keep reading because it matters." Tennessee's youngsters are more prepared to read and their parents are better prepared to help them read because of the Books from Birth program, Haslam said. "Parents, and grandparents, and friends of little children, I want to tell you that it is so important for you to read with your children. Their brains are forming. Eighty percent of a child's brain is formed by age 3. Ninety percent is formed by kindergarten, so when you read to them language is forming in the synapes of their brain. They need to hear words, ideas, sentence structure and lines. They need to have hundreds of books read to them," she said. During the years they can participatie in the Imagination Library, they have 60 free books available for them, Haslam said. Addressing the youngsters in the audience, the First Lady urged them to raise their hands if they like to read. She was pleased with the response. "That's terrific. That's all this is about. "We want you kids and your parents to read 20 minutes a day. Think you can do that? It's not as long as it sounds. People all over the state are starting to read 20 minutes a day and it makes a big difference in the preparation of our kids as they come into kindergarten," Haslam said. Research is showing that kids who have been a part of this program show a difference and that difference lasts as they go through school, she said.